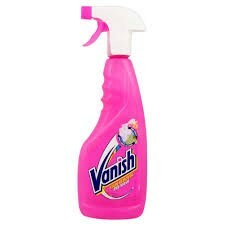 In the USA, Vanish is a brand of toilet bowl cleaner manufactured by S.C. Johnson. They obtained the brand through the purchase of The Drackett Company in 1992. Drackett purchased the product from inventor Judson Dunaway. Vanish is now sold in the USA under the Scrubbing Bubbles® Vanish® Continuous Clean Drop-Ins™ brand name.